…so says Sight and Sound. I can’t say that I agree, but it is a fantastic film, and anything that gets more people watching it (as this undoubtedly will, and as their previous decades-long pick Citizen Kane undoubtedly did) is alright by me. It’s a masterpiece, unquestionably, but I don’t even think it’s Hitchcock’s best…which says more about the brilliance of the director than it does about any relatively lower estimation of this film. The first time I watched Vertigo it was eye opening. It was one of the defining artistic experiences of my life, right alongside the first time I listened to (as opposed to heard) the music of Bob Dylan, and the very first time I pulled Catch-22 off a shelf in my school’s library. But Vertigo didn’t hit me in quite the same way. 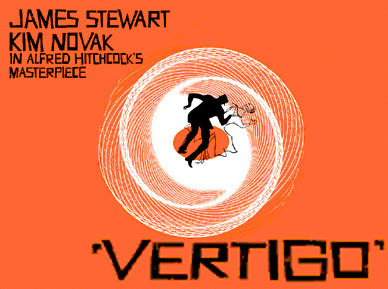 Whereas those other two experiences were more like accelerated awakenings to a gorgeously complicated world of invention woven into, around and through our own, Vertigo was a single, glorious slap. It’s Hitchcock’s supreme shaggy dog story, and you don’t — and can’t — quite know what you’re watching until it’s already over. It’s a fact that’s thematically appropriate for the film; does it matter what something is? Or what it appears to be? Does one matter more than the other? And can one suddenly stop mattering to you, against your will? Vertigo plays out like a cruel practical joke — also appropriate to the theme of the film — and outright abuses you as it changes your life. I once read a review of the film that described it as (paraphrasing here) sloppy, with all of its plumbing hanging out. I think that’s true only to an extent…it’s a film its plumbing exposed by design, so that you’ll get distracted by its “sloppiness” while the real experience sneaks up behind you. Get lost in the details — and you will get lost — and the film will leave you to your fatal fall. I saw it for the first time in college, and then did not see it again for many years. When I finally did revisit it I was surprised at how much of the film I had forgotten. Entire sequences were missing from my memory…details and moments that now seemed to important to me felt like I was experiencing them for the first time, even though that clearly wasn’t the case. It took several more viewings, with similar experiences every time, before I understood why: Vertigo is not a film about what happens. It’s not about its details, its moments, its dialogue, its plot or even its characters. It’s a film about its own impact. And that impact lingers. Tightens. Grows. The details, we’re violently assured, don’t matter. What matters is whatever you feel when you’re looking down that endlessly elongating stairwell. After all, by the time you get to that point, it’s all you have left. Psycho is about what happens. Vertigo is about what doesn’t happen. What didn’t happen. And what, regardless of how desperately we try, can absolutely never happen. I don’t think it’s the best movie of all time, though. And you know what? It doesn’t matter. If we need to have lists like this, then Vertigo does deserve to be near the top. And if we don’t — and we don’t, despite what you’ll see below — then no harm done. If you’ll excuse me, I feel the need to rewatch it…so I can forget the experience all over again. I suggest you do the same, and we’ll all meet again at the bottom. The full Sight and Sound lists follow. You know an old film I really like? “Philadelphia Story.” That had a lot of charm. I have never seen “8 1/2,” but Fellini did make one movie I really like, “La Strada.” I have seen dozens of fantastic independent films (mostly foreign, because oddly, American independents tend to stink) that never show up on these lists. That’s because I used to live a block away from the greatest theater of all time, The Ken in San Diego. It’s probably gone now, or just become some rubber-stamp Landmark theater. Sigh. Oh, and also, the French: they’re as annoying as hell, but they make great films.